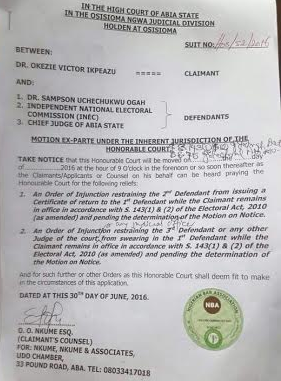 Following a court order, the Independent National Electoral Commission (INEC) today issued a Certificate of Return to Mr Uche Ogah, who came second at the last Peoples Democratic Party (PDP) governorship primaries in Abia State. On the account of allegedly using fake tax returns during the primaries, Justice Okon Abang had stated that the incumbent governor, Dr Okezie Ikpeazu was never qualified to run in the PDP primaries as a governorship candidate. He nullified Ikpeazu's election and ordered INEC to issue a certificate of return to Ogah. 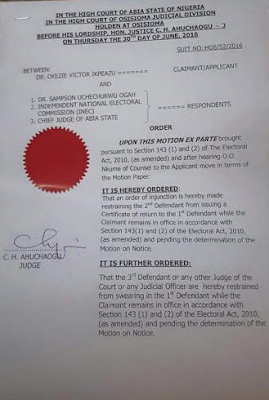 However, the state government on it's facebook page, Abia Online, published this court injunction secured by the state Gov, Okezie Ikpeazu preventing Abia Chief Justice or any other Judge from swearing-in Uche Ogah as Governor of the state while he remains in office pending the determination of his appeal.